Antibacterial, revitalizing, comforting and unifying. 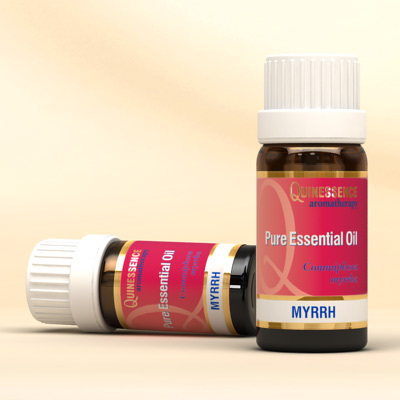 Used by the ancient Egyptians in the embalming process because of its remarkable preserving action on the skin, Myrrh Essential Oil is used the same way in aromatherapy today to restore and revitalize tired or mature skin. Many aromatherapists use myrrh in the battle to minimise wrinkles because of its ability to stimulate cellular renewal. Myrrh Essential Oil is highly effective when treating dry, chapped and cracked hands during the cold and windy winter months, and just a few drops added to a carrier cream or lotion massaged into the skin works wonders. Myrrh oil is an expectorant which makes it even more valuable during the cold season to ease coughs and clear phlegm, and when used in massage blends it helps ease everyday muscle and joint pain. Due to its antiseptic and healing qualities Myrrh Essential Oil makes an excellent mouthwash for promoting oral health. It soothes mouth ulcers and sores, helps keep gums healthy, prevents tooth decay, and to neutralises bad breath. When vaporised, the bitter-sweet resinous fragrance of Myrrh Essential Oil is comforting and uplifting to the spirit.